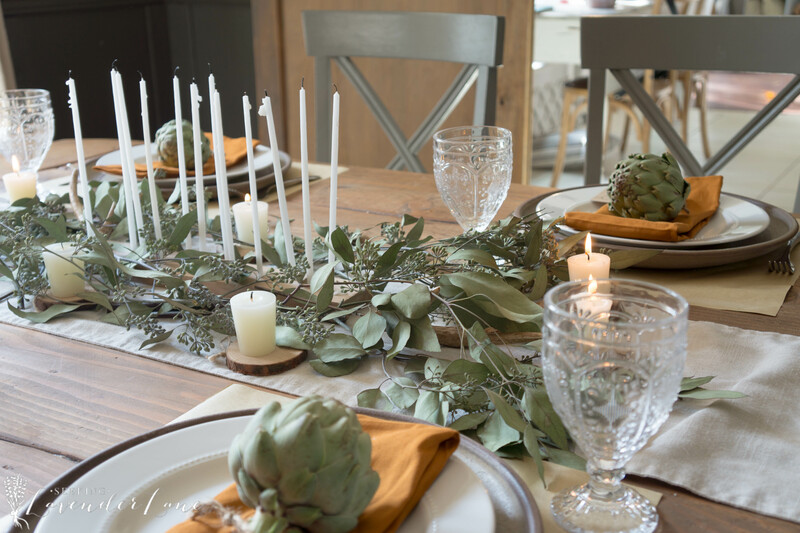 Neutral Thanksgiving table with seeded eucalyptus and artichokes. Happy Election day! who am I kidding? happy that it’s just about over…am I right? Since, you probably are just about done with this election and the chaos it’s caused our country and our homes, how about we move on to something a little lighter. 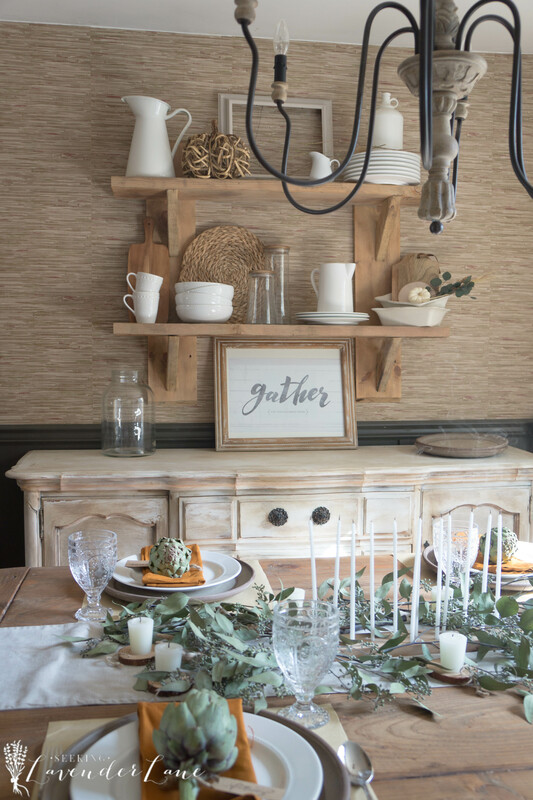 I’ve got a great round up of amazing Thanksgiving tables for you today. 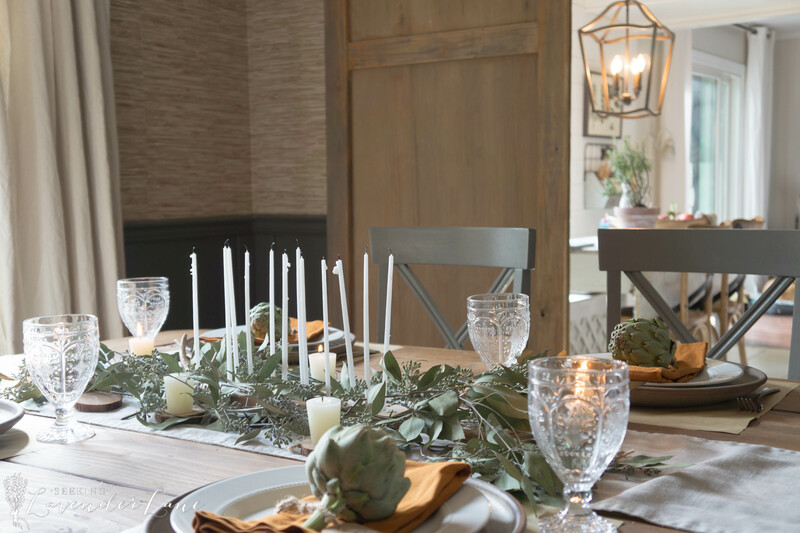 I’ll be sharing my Thanksgiving table here and then at the bottom of the page, I have links to all of my friend’s pages with their tables. 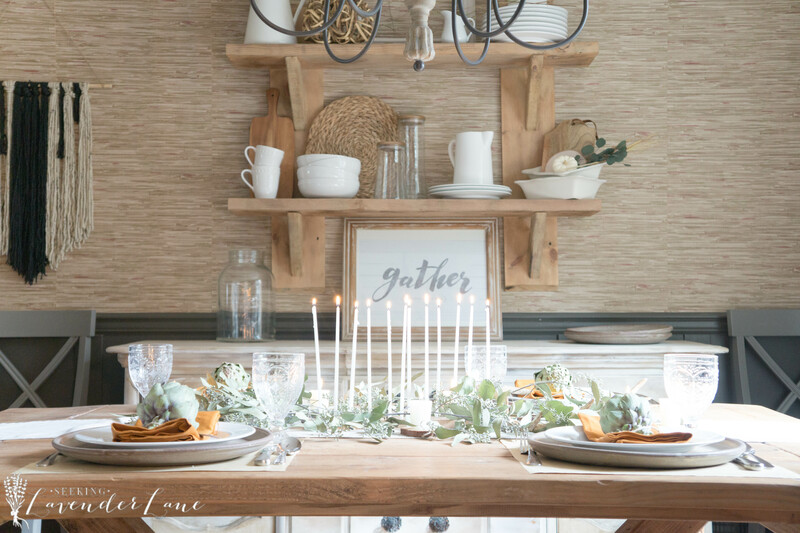 I gathered a group of different style bloggers here, so we can share with you all different ways you can decorate for the season. There’s not just one answer or one wrong answer. 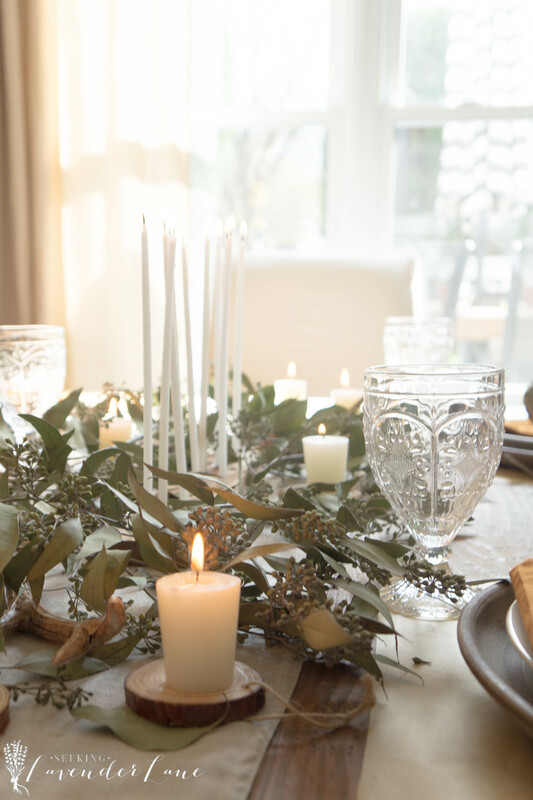 You can make your holiday table setting just the way you want. 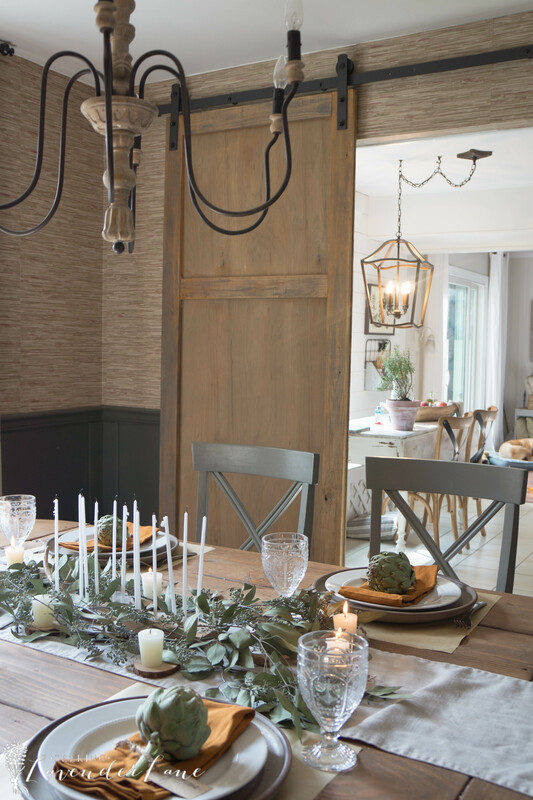 I hope that these ideas here today inspire a beautiful decorated space that impresses your family and friends this year. Mix and match ideas from each of our tables, or save one for Christmas, why not?! I’d like to call the theme of my table more Farmhouse natural. 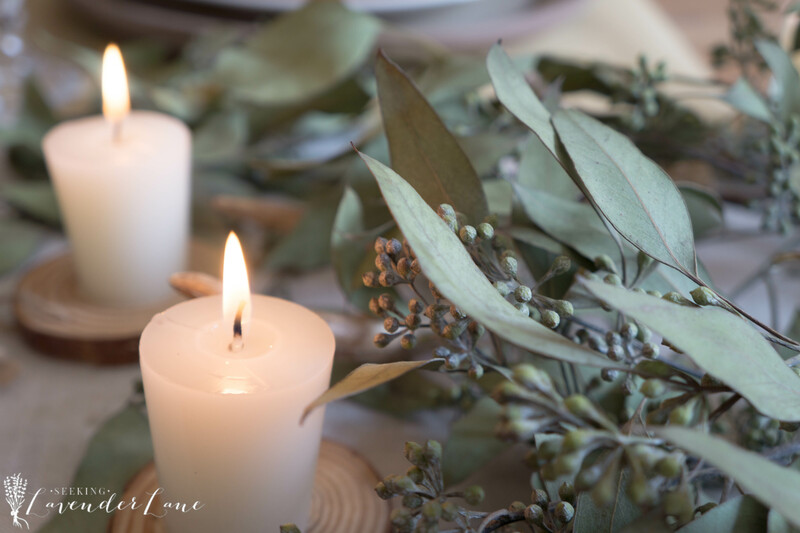 I kept with a natural garland of Seeded Eucalyptus, and then paired that with some romantic lit candles. White dishes is always a must at my house, and I grabbed my hand me down family chargers (that I LOVE). 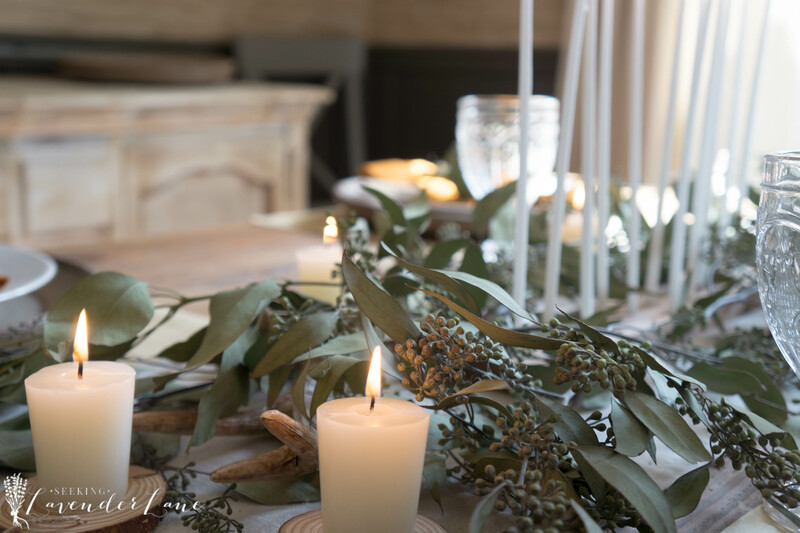 The table decor just arranges nicely with my rustic table, so I love how easy and neutral the tablescape comes together. 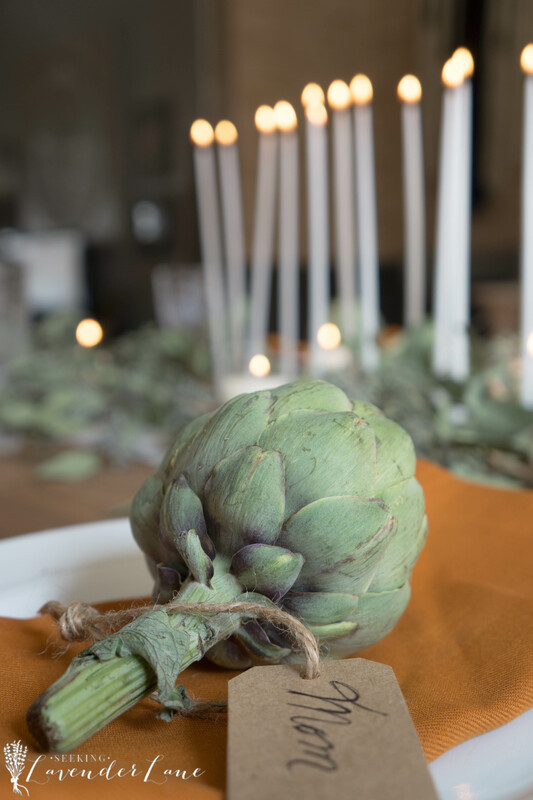 My favorite detail for this year’s table is the artichoke name settings. 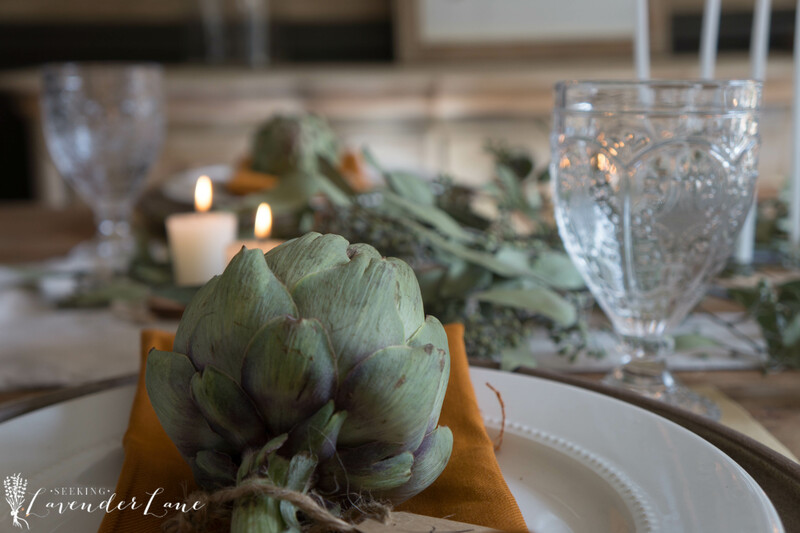 I love to decorate with artichokes more then I like to cook with them. These were the perfect subtle green touch to the white plate, and pair nicely with the neutral name tag. If you’re more daring then me, you can cook with these after or as I just did, let them dry out and use them in my Christmas decor (more to see another day). hint: Reuse what you have, it always keeps costs down! As for the gorgeous rust napkins I got those here, for a steal of a price! Grab them in every color!!! 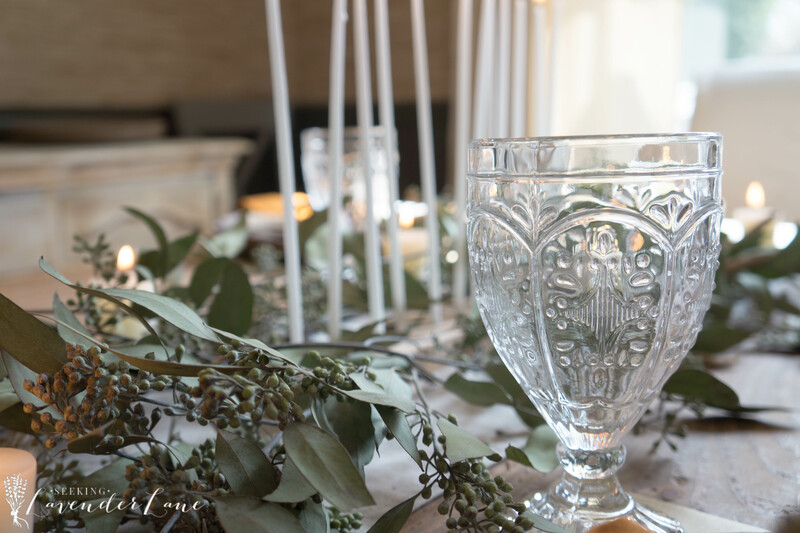 I bet you are wondering about my candle holder in the center of the table? The hubby and I created that with some scrap wood from the garage, that we drilled some holes into and then stuck the candles in. I love these! They create that romantic feel to my table. Since, Fall and Thanksgiving are all about the warm outside colors, and I am more about the neutral colors…I chose wisely where I was going to add my warmth. 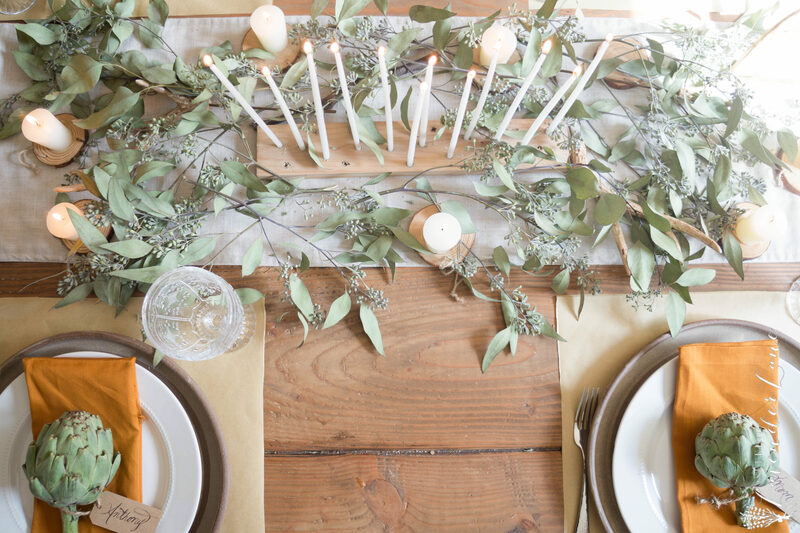 To here I added just the rust colored napkins, and loved how they work with all the greenery and whites. You can add warmth in other ways as well! Add some gold flat ware, or even add a runner with a little orange or yellows. Another great way, is to add some of those Halloween pumpkins to the tabletop. 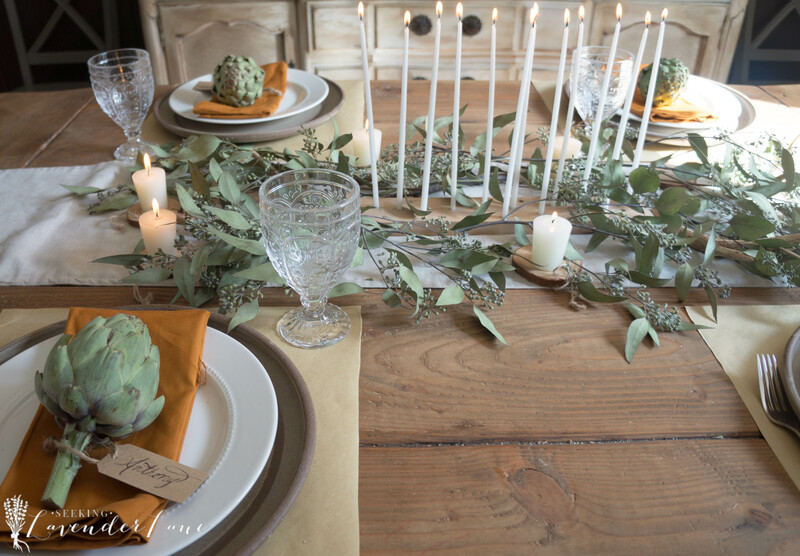 Mix the green with those warm colored squash and you got yourself a gorgeous table! Loving my Gather print as well. It really completed my Thanksgiving space. 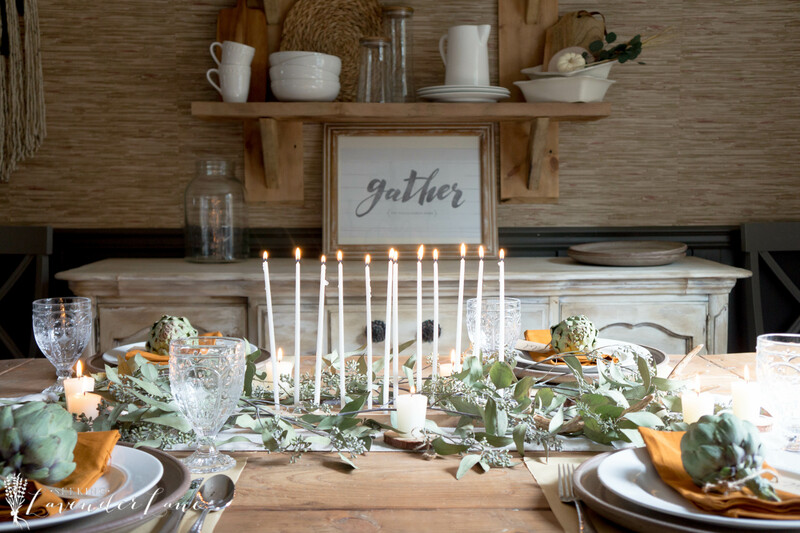 Grab this gorgeous Gather print from Jibeprints.com , they have so many great holiday prints perfect to switch out for your holiday decor. 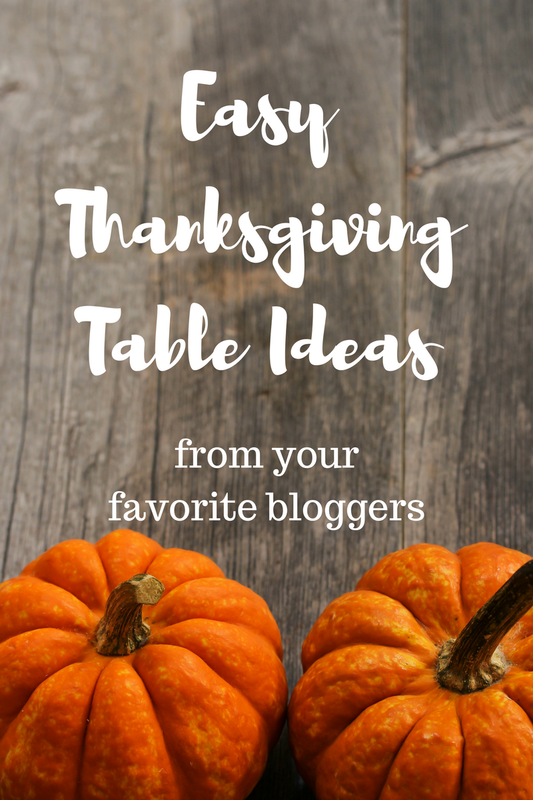 NOW Stop by and See all the other gorgeous Thanksgiving tables! Thanks Amanda, you as well! So pretty! 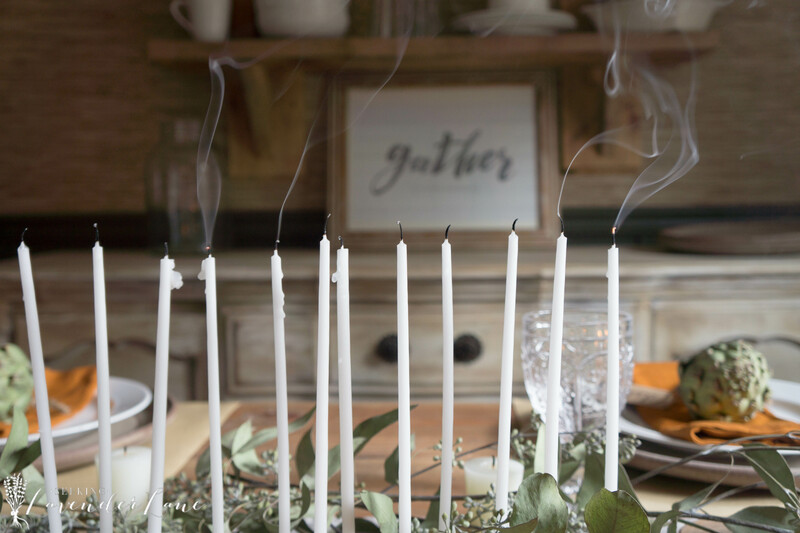 I love those skinny candles! Thanks Tara, yes when I saw them I had to have them! So stunning, Deb, as usual! The mix of natural elements is beautiful. 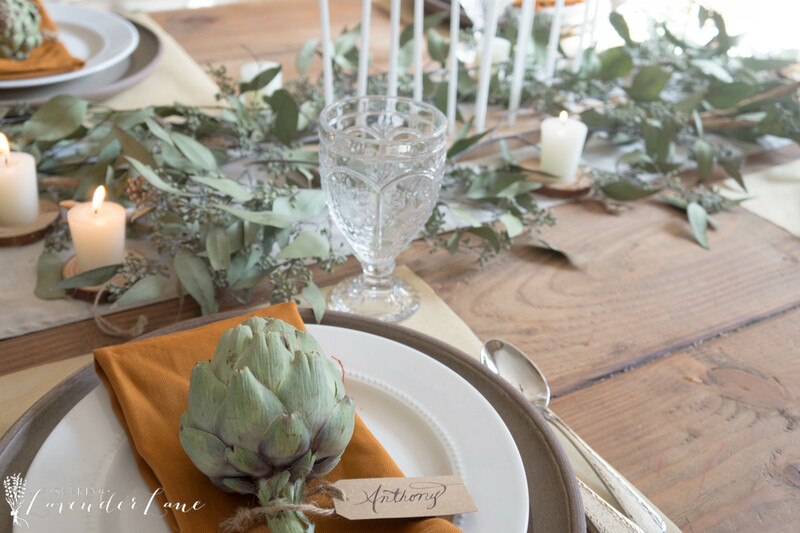 I love the idea of using artichokes as name settings! The candleholder is a really cool piece, too. Everything just works so perfectly together! Love it! Thank you so much Sarah! 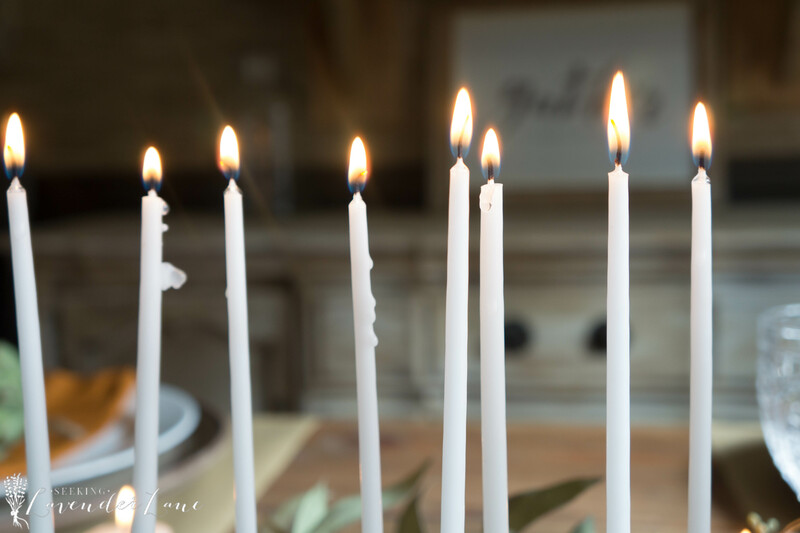 I love the soft feel of the table and the thin candles are lovely. Good work! Thank yo so much Randi! I love this! It is so relaxed and cozy feeling! 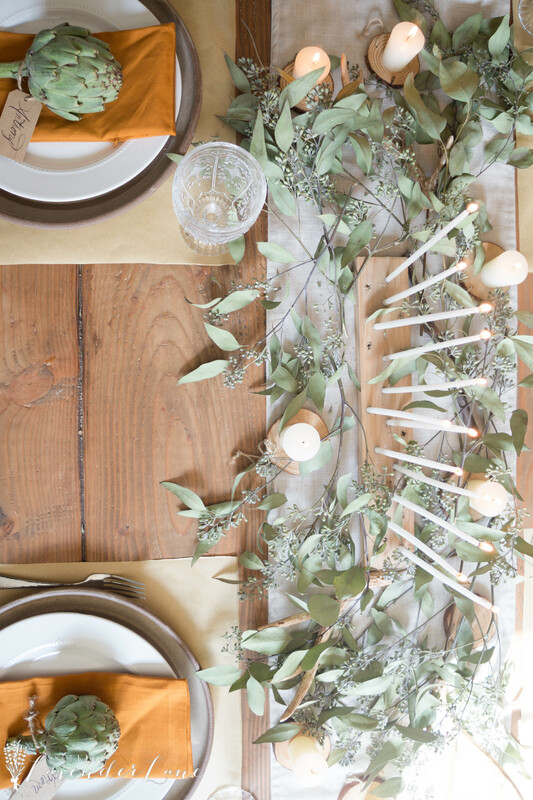 Pinning to my table setting board on Pinterest! Thank you so much Jaclyn! I love a well designed home and I believe you can create this on every type of budget. as I design and DIY on a small budget to create my white picket fence dream.